A huge distracter photo. 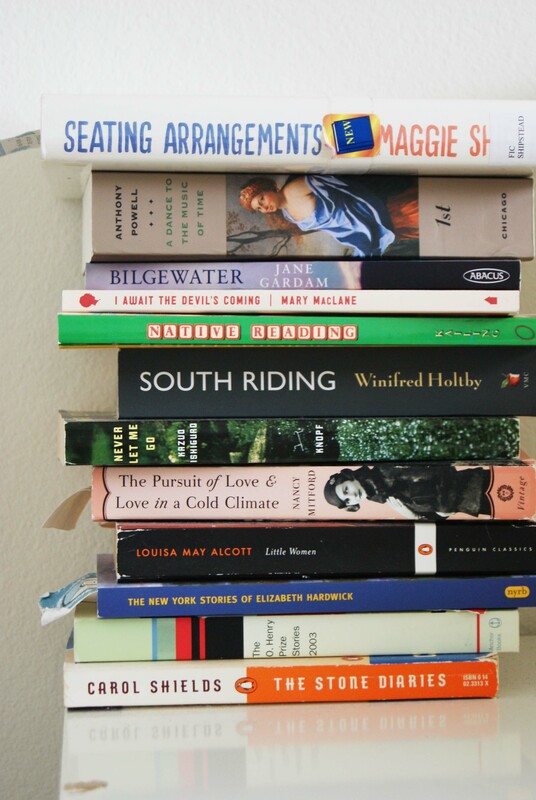 (Of the growing TBR pile on my bedside table that will probably literally kill me in my sleep one day.) MOM: if you’re reading this, just don’t. Spoilers. Ha! 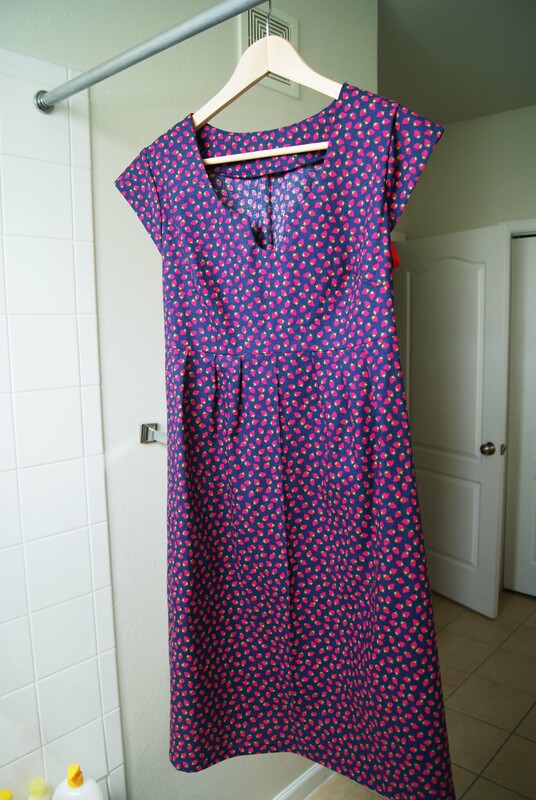 Now that she’s gone, I’d like to share a couple of photos of the Washi Dress I made for my mom’s birthday gift. Because it’s for my mom, I basically tried everything not to have to put on this dress and sweat in it. I stood in the bathtub. So I put it on, and was all, I’ll stand reeal still and take some bathroom selfies, and I won’t put my arms down so I don’t get deodorant on the dark fabric. I gave in and dragged out the tripod, huffing and sweating. I figure she’s my mom, she won’t mind if I put on her dress for just a little while to show it off. And then the photo was blurry. But! I think you get the picture. I bought the fabric from Pink Castle Fabrics‘s Skinny Sale, their Memorial Day Weekend sale. It’s Kokka! A strawberry print from Trefle. Basically I don’t even want to admit what a great deal I got on 3 yards of this, because it feels kind of immoral. Like I stole it. I made a size L, for my mom. As you can see on me (I’m on the small side of M, or the large side of S? ), this dress is just cut so well that even if it’s too big, it still looks totally cute. Maybe that will motivate some chickens to try it, eh? Even if you pick the wrong size…it’ll probably still be cute. Now, I’m just hoping that the strawberries aren’t too juvenile for my mom. I chose the print because, well, Kokka + deal = win, but also, my mom always chooses strawberry shortcake as her birthday cake, every year. In her teenage years she had a thing for Strawberry Shortcake, and I remember reading Lois Lenski’s Strawberry Girl many times with her growing up. Strawberries just make me think of my mom! 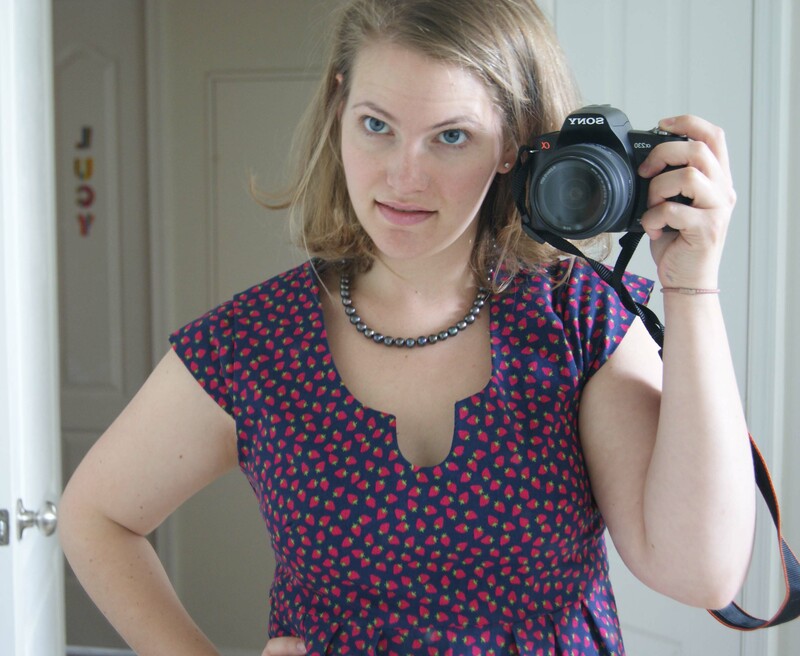 I think the scale and the navy background help the print read grown-up and not little-girl. Linking up over at the Pink Castle Fabrics Blog, in their Made With Pink Castle Fabrics monthly giveaway! Head over and check out the other cute makes. The pool grows every month!